…Chicago’s Lincoln Park used to be the city cemetery, but it’s only got one tomb left? Today, Lincoln Park alongside Lake Michigan is known for its rolling greenery, its numerous bike trails, and its upscale inhabitants. But underneath it all, Chicago once buried its dead. In 1843, City Cemetery began accepting burials between North Ave., Clark St., Wisconsin St., and the lake. It contained a Jewish cemetery, as well as a potter’s field where 4,000 Confederate soldiers met their end after enduring Camp Douglas. Being the only public cemetery within city limits, space filled up fast. With crowding came ramshackle maintenance and a concern for public health, as cholera outbreaks were common at the time. 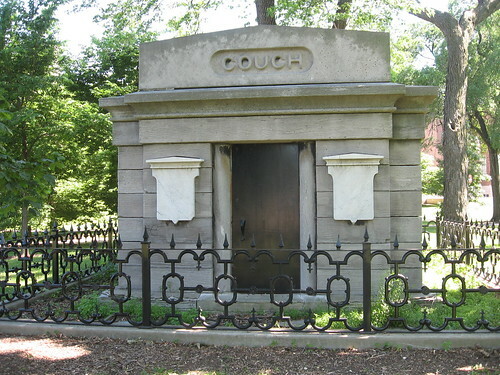 In 1857, a plotholder in City Cemetery, Ira Couch, died while on vacation in Cuba. A grand tomb costing $7,000 (nothing to sneeze at back then) was erected in 1858, even as demands came from the people to turn the cemetery into a park. A year later, Rosehill Cemetery opened, followed a year after that by Graceland Cemetery. Both graveyards were miles from Chicago, far away from the populace. People began moving their families from the flailing City Cemetery into its more spacious, rural counterparts up north. By 1866, burials had ceased entirely; disinterments went on until 1895, until Lincoln Park’s transformation was complete…except for the lonely Couch tomb. The Chicago Fire rampaged through it in 1871, supposedly burning many wooden markers and rendering gravesites lost. This has led to bones being dug up during area excavations. An even older cemetery, from before Chicago’s incoporation, resided south of Lincoln Park, between Chicago and Oak Streets. You may recognize this location as the home of Water Tower Place and the John Hancock Tower. No one knows for sure just who is buried in the Couch mausoleum. Record keeping tended to be spotty at best. The tablets flanking the vault’s door seem to have never been inscribed. According to various accounts, as many as 13 and as few as zero could be enshrined. Source: the extremely thorough Hidden Truths website by Pamela Bannos, with much research and ephemera relating to Lincoln Park’s conversion. Check it out! Join us next week when we take to the ocean depths!